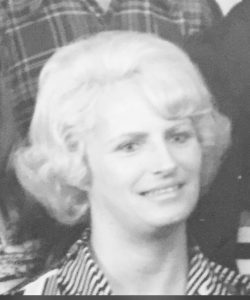 Jeanne P. Panneton, 87, of Merrimack, NH and formerly a longtime resident of Lowell, MA, passed away on Sunday, December 6, 2015, at her home surrounded by her family after a period of declining health. She was born on December 29, 1927 in Lowell, MA, to the late Eugene and Marie (Leblanc) St. Louis. She was raised and educated in Lowell. She worked in the Lowell Mills as a young woman, and had worked for Lowell Bank & Trust for many years. Jeanne also was an active member of St. Vincent de Paul and Ste Jeanne d’Arc Parish activities. She moved to Merrimack, NH in 1994 and was active in the Merrimack Seniors Club, Wentworth Seniors. She was a communicant of Our lady of Mercy Church, and supported the comfort meal mission at the church. Jeanne was predeceased by her husband Lionel Panneton in 1996; two brothers, Maurice and Gerard St. Louis; and a sister, Lillian Grecko. Surviving members of her family include two sons and daughters-in-law, Richard Panneton and his wife Linda of Dracut, MA and David Panneton and his wife Penny of Bolton, MA; two daughters and a son-in-law, Donna Parent of Bedford and Linda and her husband David Thompsen of Dover; 10 grandchildren, Lori, Scott, Jason, Matthew, Kevin, Christopher, Sara, Zachary, Jeffrey and Laura; three great-grandchildren, Rachel, Cali and A.J. ; and many nieces and nephews. A Memorial Mass will be held at Our Lady of Mercy Church, 13 Baboosic Lake Road, Merrimack, NH on Friday, December 11 at 9:30 AM. A private burial will be held in St. Joseph Cemetery in Chelmsford, MA at a time that is convenient for the family. In lieu of flowers, memorial donations can be made in Jeanne’s memory to the American Heart Association, 2 Wall St. #104, Manchester, NH 03101 or to the American Cancer Society, 2 Commerce Dr. #110, Bedford, NH 03110.